In 2017, Coca-Cola introduced a line of regional slim bottles, with beautiful artwork celebrating cities and regions including Tokyo, Kyoto and Yokohama. With thirsty travelers gearing up for summer vacation, the company has announced six new designs that collectors and Japanophiles won’t want to miss! Up first is the Sendai bottle. It features the city’s feudal samurai lord Date Masamune, in the same horseback pose as his statue, which welcomes visitors to the largest city in the northeastern region of Tohoku. While every other design in the series is rendered only in Coca-Cola’s traditional red and white, Nagoya’s new bottle is bold in gold with its depiction of the kinshachi, a mythical creature that adorns the uppermost roof of Nagoya Castle. Connecting Chiba Prefecture with Tokyo, the Tokyo Bay Aqua Line expressway—which runs straight across the bay and offers breathtaking unobstructed views—is the subject of the Chiba bottle, which also gives a nod to the coastal prefecture’s renowned surf spots. The National High School Baseball Championship has been a highlight of summer in Japan for decades. The championship game is always played at Hyogo Prefecture’s Koshien Stadium (roughly halfway between Osaka and Kobe), and the venue serves as the inspiration for the fourth new bottle. 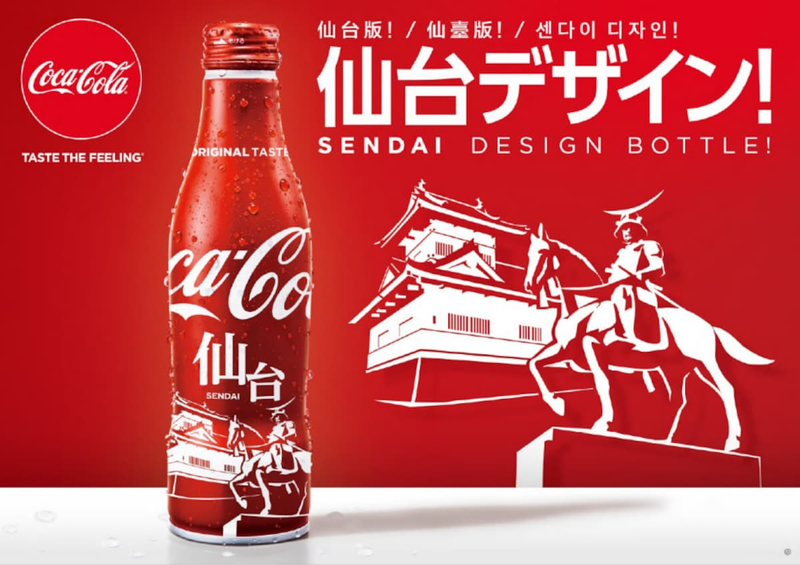 And last, Coca-Cola gets cultural with its Meiji Restoration (Meiji Ishin in Japanese) bottle. It commemorates the 150th anniversary of the 1868 event in which the emperor was restored to power over the shogun, which ended Japan’s feudal period and ushered in modernization as the country opened to the outside world. Seen on the bottle are politically progressive samurai Saigo Takamori and Sakamoto Ryoma, both key figures in this turning point in Japanese history. The 250-milliliter (8.5-ounce) bottles are priced at ¥125 (US$1.15), and go on sale June 25, 2018. Each design will primarily be offered in and around its respective city/region. The Meiji Restoration bottle will be offered in western Japan, in recognition of Saigo and Sakamoto’s respective birthplaces of Kumamoto and Kochi Prefectures.